Sameer means “ a wave of cool air”. To us three sisters, he was our cool, super intelligent cousin who used to breeze by during the summer holidays of the 1970s….so we would like to take you down the memory lane of the young Sameer. The most distinct memory we have of him, starting with playing board games like Clue, Monopoly, Life, Millie Bornes, which we even play today with our kids. He would always win but eventually taught us the tricks of winning. We used build car tracks in the hall of our grandparents’ house and race with the Hot Wheels cars. He introduced us to different kinds of food, candies, Archie comics, Highlights magazine, and the whole American culture. Your dad was also mischievous as he taught us to clog the drain of our small bathrooms in India with clothes and fill it up with water to make a swimming pool inside the bathroom. As if that were not enough, he made us put baby powder on the tiled floor and turned into a sliding/skating rink. Of course we got into trouble and he always got away as he was a ‘guest.’ As we got a scolding from our parents, he would stand calmly and chuckle away. Your dad loved to tease everyone, ask your Uncle Shalin about that, but at the same time he was never offended when we teased him right back. We have never seen Sameer angry, mad, or upset. His cool demeanor matched his name. To him there was always another train, another show, another flight. The best part about him is that he could laugh at himself. In the 1980’s his visits to India with friends were very interesting as he could adapt to any situation. When you see him he would be this buttoned up shirt guy who could only live in places with comfort, and then next thing you hear that he is traveling on a local crowded bus to some place. His love of travel was legendary. In the 1990’s, we all got married and moved to the US. Sameer became Sameermama to our children. He became the uncle who always got them books and was never without a book. His favorite book being Charlotte’s Web (which, by the way, he gave two copies to each of our kids) and The Great Big Atlas. Our children cherish these books and memories shared with their dear Sameermama. Today we remember him through these memories that we have of him. There are many funny anecdotes that have occurred through the years. But the best way to remember him is to read, study hard, travel, and think of visiting places which are not ventured by all. He was proud of his education, his family, and lastly, but most importantly, you, his children. We hope you have gained some insight on your dad through our eyes. We remember him fondly, with a twinkle in our eyes which are shimmering with tears. We love you dear brother and miss you always. Attitude! Sameer was one of the most well behaved and enjoyable boys on my team, as he always “gave his all” with enthusiasm, without complaining, even though there were many times it was hot, it was “buggy”, and it was raining. He never got discouraged when he went into a slump, and he was humble when he was on a hitting run. Sameer and Shalin were great kids on my Indian Harbour Beach Lions team. They showed up for every practice, played any and all positions they were asked to play, and were an integral part of our championship season. Their skills improved tremendously over the season, because they were willing to do things over and over until they got it right! They were great companions to the rest of the team, as they were two boys that everyone liked. We have known Sameer since his birth in Cleveland. Our fondest memories of him are when his parents left him with us when they went on vacation and he was less than a year old. He was like a son to us. Our children grew up together till the Shah family moved to Florida. Our last meeting was in Thanksgiving of 2010 at a friend’s house. We were never to see him again. He was always respectful and courteous. We have never seen him angry. His many memories will be with us forever. May God give comfort to his family. In the mid 1970’s, Sameer’s family and our family shared many happy times in Melbourne, Florida, where his father and I worked together. Picnics, pool parties, etc. brought many Harris families together and formed bonds that last to this day. 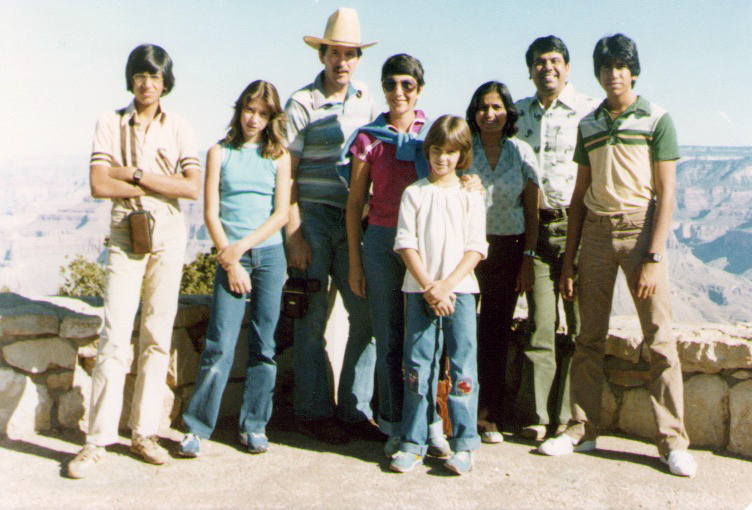 In 1980, Sameer, his parents and brother came to California, where the eight of us set out on a two family adventure in a single passenger van with no air conditioning. We toured the highlights of Nevada, Utah, Arizona, and California. Sameer most often rode shotgun, and was the “navigator” of the trip. He became especially enamored of the Moqui Caves, and insisted that we include them on our itinerary. Sameer also got a big kick out of my playing tricks on a drive-in restaurant, driving through over and over again. Sameer was a prince. He was bright and funny and got along famously with everyone on our Cowboys & Indians Tour. Fortunately I was able to see Sameer last year, 2010, after many years apart. Seeing him brought back all those wonderful memories of the times our families spent together. Both of our daughters were devastated by the news of his demise. Lisa began storming heaven with prayers, and Leslie said she had no words, only tears, for the family. We were blessed to have known Sameer and his family. We know all of his good qualities will be reflected in his children, and we want them to know he was loved by us.